Thanks so much for this work. This kind of bugfixing will be great when I move to Plasma 5. I like the idea of an LTS release, too. Thank you for your work! Certainly Plasma has improved in multiscreen management but there are still many areas where the user experience is far from ideal. Another problem I see is that the Display Configuration dialog doesn’t fit on my 1366×768 screen so I’ve to use Alt+click to drag the window in order to click the OK button. AFAIK 1366×768 is a fairly standard resolution for laptops so a redesign for the dialog should be considered. I think something like Spectacle vs Ksnapshot is a good starting point. A patch for the last ones is currently in review. Thank you too for your work. Kscreen works quite stable for me in the last releases. I want to make a point about the usecases. I have a multimonitor desktop (static workstation) and I don’t want to use the same configuration all the time. Instead I have three configurations that I switch between (this is quite similar to the docking case, where you also have several configurations to switch betwwen). 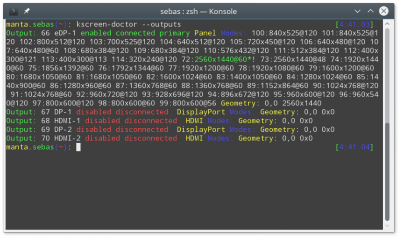 What do you think of a dialog in kscreen, to save this configurations (“Save actual display configuration under the name: …”) and a hotkey etc. to switch between them? Another unrelated question. I have my TV connected to my PC. Is it possible to switch only one monitor off (in software without changing the display setup)? Interesting. Could you describe the three setups you want to switch between in a bit more detail? There is a couple of ways to do that already, depending on your exact setup and configuration. My display configuration is a “main monitor” 2560×1440 connected with Display Port, a 1080p monitor on the right side connected via DVI and a 1080p TV on the left side connected via HDMI. (I have to align the 1080p displays at the center of the main monitor, otherwise the plasma control panel switches to the TV). To my second question, switching off one monitor: The problem is, when looking a movie on the TV, I don’t always need the mainmonitor. My display setup nevertheless is: Main monitor activated and TV left to it (aligned at the center), the panel is on the main monitor. My ideal solution would be, the main monitor would detect, that there is no activity on it (only on the TV) and go into standby mode (so wobbling with the mouse would turn it on again). This does not happen, I think, because the movie deactivates the standby. So the simplest solution would be, to switch it off manually. If I use the hardware button of the main monitor itself, the monitor turns off, kscreen(?) detects this, the right monitor turns on and displays the same picture as the TV, the plasma panel (previously on the now deactivated main monitor) went to the middle of the now visible picture and the whole system does not react anymore. Turning the main monitor on again, restores the previous behaviour (except that the panel is on the TV). So I assume the main monitor sends some signal, and plasma react in a way, that I don’t want. The behavior you’re describing sounds more like what happens when I unplug the DVI or HDMI from my main monitor or tv. Perhaps this is a setting on your monitor which causes the power button to “unplug” the monitor. If so, this might just be something you can change in your monitor settings, instead of being a problem with kscreen. I have no doubt that this is a relatively specific behaviour of the interaction between my monitor and the software (anyway, not reacting anymore and placing the panel in the wild is a bug). For me it looks also, that kscreen reacts, as if the monitor was removed completely. This is the reason why I asked for some kind of software switch to turn this one specific monitor off/in standby. Thanks for the tip with the monitor settings, I will take a look. I recently ran into this problem with KDE Plasma 5.7.x on my machine. 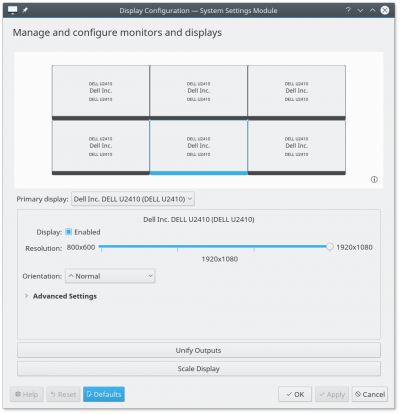 My solution was to set my monitors up with NVIDIA’s settings and once they were positioned how I wanted them I turned off KScreen’s autostarting in System Settings. This successfully stopped KScreen from messing up my setup. I look forward to 5.8 addressing this issue and if there is anything I can do for testing this bug I’d be happy to do so. I wasn’t having this issue with Plasma 5.5, I only encountered it via 5.7.x.